Dom Lorenzo Scupoli was born in Otranto, Italy in 1530 and died in Naples in 1610. Nothing is known about his early life. At about the age of 40, he entered the Theatines and made his novitiate under St Andrew Avellino. He was ordained in 1577. 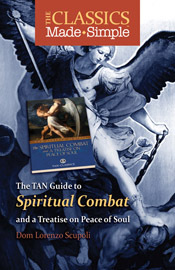 It is said that he met St Francis de Sales in Padua between 1589 and 1591 and gave him a copy of The Spiritual Combat. For some reason that has never been revealed, he was laicized in 1585 and lived in retirement in Theatine houses until his death. Some sources say that his name was cleared at the end of his life, though he offered no defense of himself. The first edition of The Spiritual Combat bearing Scupoli s name was published in the year of his death 1610.